Why “Hot Stuff”? Because I finished Sizzle! Here it is, still blocking, but I’m planning to wear it tomorrow and will hold Kris down if necessary to get a picture of it actually on me. I love the way it fits, and if you are at all considering this pattern, I have one thing to say: DO IT! It rocks. I’m quite proud of myself on this one, actually. Guess what I did on the shoulders? I GRAFTED them. That’s right – after my kitchener success on the Pomatomus socks, I decided to go for it, and it WORKED! Also, in the last couple of days, I got 2 packages from the Stitch Marker Swap. All the way from Scotland, here are my adorable markers from Shonze, with a nifty postcard and a little bag she knit for them. And here are the lovely ones from Esther. Thanks to both of you!! I can’t express how excited I have been to get these markers in the mail. Such lovely surprises, and such beautiful and creative work, too. As far as other knitting progress, the blog may be a little picture-light for a while. I am trying very hard to get my Christmas knitting started, but since some of the recipients read this blog, I don’t really want to give anything away. 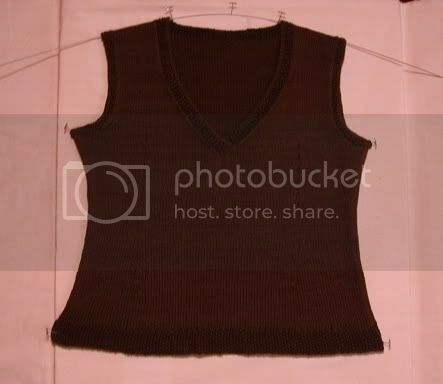 August 9th, 2006 | Tags: FOs, Knitting, Swap | Category: Misc. 10 comments to Hot Stuff! Ooo! Great Sizzle! I’ve been ruminating on buying that pattern, but I think I’m getting tank burnout. Double Ohhh! You are hot stuff! Congrats and I can’t wait to see a pic of you wearing it. 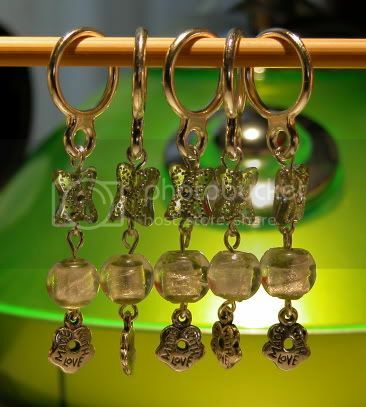 Love the stitch markers from Shonze too. PS – a curly headed wolverine ???? Yeah, it made me chuckle too. I wanna see it modeled!!!!! Wooo hooo!! I know what Sizzle looks like. I got pattern names mixed up. 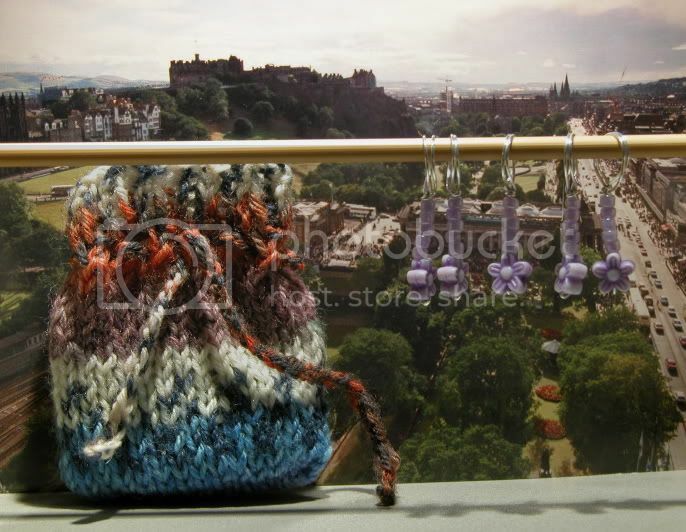 The stitch markers are gorgeous. Awesome! Can’t wait to see how Sizzle looks on you. Oh Sizzle is very hot! And what nice gifts, I love the stitch markers. You could wear this as jewelry on sizzle practically. great sizzle! love the stitchmarkers too….